Here are a few useful mods I've found for the radios I have. Overall this is an excelent microphone out of the box...one issue I found though is the "lock" switch only locks some of the buttons, though most annoyingly it leaves the PTT unlocked. 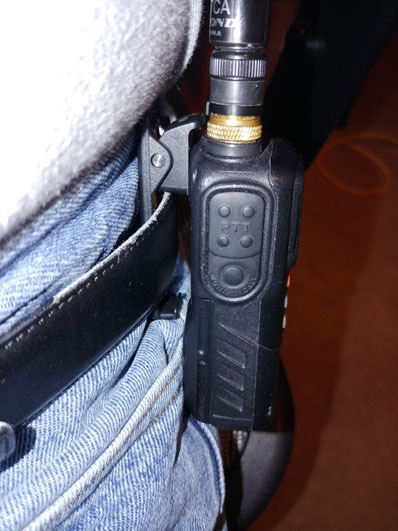 I find this to be a problem when oeprating mobile, I typically lay the mic in a tray or cupholder that keeps it out of the way but it can move around a small amount which means the transmitter could be keyed by accident. Best-case this would result in a rather embarrasing personal conversation being broadcast or worst-case it could end up causing perminant damage to the radio (for example, going thru a full service carwash when the antenna is removed if they bump power on and the mic gets keyed). By unsoldering one jumper and soldering another, it's trivial to make the "lock" switch disable the PTT button preventing any unintentional transmissions. I found a wealth of information documenting all the possible jumper combinations and very clearly iullistrating what jumpers are where located at amateurtele.com, although the original page is in dutch. Fortuniately, you can read it fairly easily in English with Google Translate along with some minimal inferances applied to the table (O=open, X=shorted, Nee=No, Ja=Yes). In the event that site goes away, I am also hosting PDF copies of that page both original and Google Translate English locally on my own server but please refer to the original page if possible since it has a lot of other useful explanation and they diserve credit for the information. This project was to make a replacement improved belt clip for my VX-6R radio when the plastic C-shaped one broke. The same should apply to the VX-5R, VX-7R, VX-170, VX-177, VXA-300, VXA-710 and others using the same mount. LEDs are 3mm standard red LEDs from RadioShack with the top half ground off so they are half as tall. This way they clear the PCB "guides" that are on the bottom of the radio display so I didn't have to modify the radio itself. They are grouped in 2 groups of 5, the left 5 and right 5 are then in parallel. Liquid electrical tape was applied to seal the back of each LED so it can't short on the metal frame of the display. The 4th and 7th LEDs got a dot of hot-glue to hold everything in place, these two locations don't have pegs/supports blocking them on the cover so it still fits. Also put a tiny dot of hot-glue to hold the wires where they wrap around the PCB to keep it away from screws while assembling it. With the front PCB installed in the cover I added 2-pin disconnect plugs so the halves can be more easily separated to work on them. 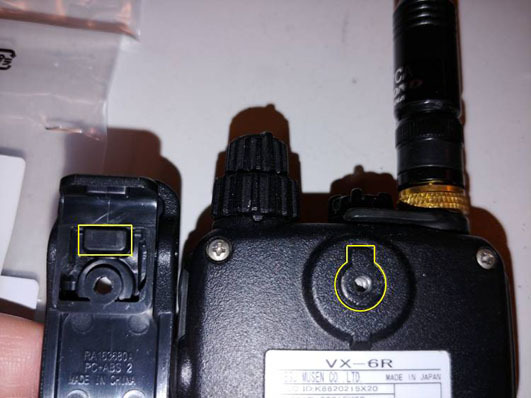 Power comes from the +9 and GND pins on the remote-head jack which were documented in the Yaesu service manual (and confirmed with a multi-meter). An on/off switch could probably be added to the back but I didn't think it was needed. I picked resistor values for the LEDs so they were a brightness I find comfortable, there isn't any specific right or wrong value so YMMV. I think I used about 100 ohms judging by the photo but I can't remember for sure. Note, +9V power should be tapped at the head main connector, NOT the microphone jack as the microphone jack has a limiting resistor on it's power supply. All wires connected and carefully positioned out of the way to close it up. Display in the dark...obviously shows only through the gaps in the buttons since they are black but it still makes it MUCH easier to find the buttons. The left freq looks broken because it's scanning and the camera didn't do a good job of freezing it, it works fine. In light it's barely noticeable.